As you ride around town on your motorcycle, you see street names, turn-by-turn directions, and what's happening behind you—all without looking down or turning your head. That's because the info is popping up on your helmet's visor. While having all this technology (like augmented reality [AR] and real-time rearview cameras) in one motorcycle helmet isn't yet a reality, it's getting close. And adding these technologies isn't just a gimmick; experts say these new features will help safeguard riders by allowing them to keep their eyes on the road. Motorcycle helmets are already essential safety gear, having saved an estimated 1,772 lives in 2015 according to the National Center for Statistics and Analysis. This new breed of helmet could help more. "Smart helmets are potentially making the entire motorcycle industry safer," Mitchell Nicholson, who runs the review site Essential Moto, says. "Plus, they're making the notion of riding a bike a lot more accessible." Thanks to custom apps and Bluetooth capabilities, some helmets on the market are ready to connect to your phone. You can take calls, hear navigation instructions, and communicate with fellow riders—all without taking your hands off the handlebars. Such features, including one that reduces the amount of fatigue-inducing engine noise audible while riding, can be set before the trip to ensure total focus on the road. A number of manufacturers are close to coming to market with helmets featuring built-in AR. "It's not a question of if; it's a question of when," Nicholson says. These new helmets will help cut down on distracted driving, as you won't need to take your eyes off the road to see things like GPS maps and the speedometer. In the meantime, you can give your standard-issue helmet AR powers thanks to an add-on: a handlebar-controlled unit that mounts on the right side of the helmet chin bar with a display located within your field of vision. What if you could look all around you in real time? One helmet combines a rearview camera with a wide view visor to allow for a 360-degree view of the road—effectively eliminating dangerous blind spots. And to make sure that other vehicles can see you better, some helmets offer wireless LED brake lights that activate whenever you hit the brakes. Coming soon to a bike shop near you is a helmet-mounted camera that will send text and email alerts to selected emergency contacts in the case of an accident—a particularly practical feature for solo riders. If an accident is detected, the camera will automatically save the last two minutes of audio, video, and other pertinent data so there's a record of what transpired. Someday soon, Nicholson says, all of these advancements will hopefully be available in one sleek-looking helmet. "I can't wait," Nicholson, an avid rider, says. 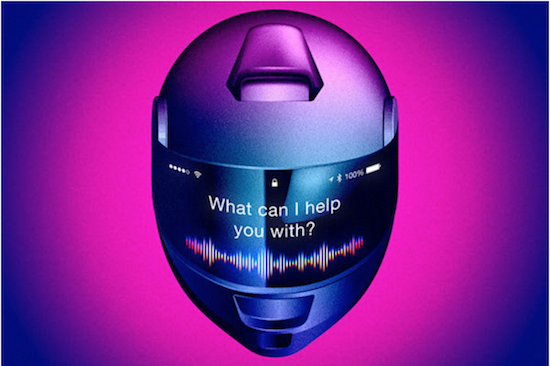 "[The helmet] will finally bring what has always been sci-fi into reality." Helmets are designed to keep you safe. Do the same for your bike and help protect it with a motorcycle insurance policy.